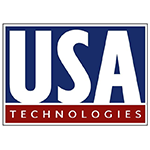 USA Technologies, Inc. is a premier payment technology service provider of integrated cashless and mobile transactions in the self-service retail market. The company also provides a broad line of cashless acceptance technologies including its NFC-ready ePortÂ® G-series, ePort Mobileâ„¢ for customers on the go, ePortÂ® Interactive, and QuickConnect, an API Web service for developers. USA Technologies has 78 United States and foreign patents in force; and has agreements with Verizon, Visa, Chase Paymentech and customers such as Compass, AMI Entertainment and others. For more information, please visit the website at www.usatech.com.